As one of Australia’s most iconic female supplement brands, Maxine&rsquo;s products have earned a reputation as some of the tastiest and most effective products to support women’s training goals. Whether it’s to build lean muscle, lose fat or improve performance, Maxine’s has a product that will cater to your needs. Expanding on their already sizeable range, the company have released one of their most anticipated products yet, their dedicated fat burner known as Maxine's Skinny Pills. There are some other ingredients such as magnesium stearate, di-calcium phosphate and gelatine, but these are more to support the integrity of the capsules and the supplement itself. In terms of formula, Maxine’s Skinny Pills provides an excellent range of fat loss ingredients. One particular highlight is the use of the three ingredients in the form of White Willow Bark (providing Salicin), Caffeine and Beta-Phenylethylamine; which resembles the now banned ECA stack. The ECA stack, which traditionally combined ephedrine, caffeine and aspirin was an incredibly popular fat loss stack in the 90s and early 2000s, but has since been banned due to potential risks. Maxine’s Skinny Pills on the other hand provide a similar version featuring similar compounds, but in a safer format. In fact, studies on this three ingredient combination has shown up to 1kg/month of weight loss over what placebos would offer1. Dandelion Root, which has been used both traditionally and in current practices as a natural diuretic5. Finally, Skinny Pills offers some benefits to focus and concentration thanks to ingredients such as caffeine, tyrosine and carnitine. During periods of weight loss and reduced energy intake, your body and mind will no doubt begin to suffer from sluggishness, lethargy and a general lack of motivation. Maxine’s Skinny Pills were designed especially to reduce these symptoms so you can continue to train and function effectively throughout the day. While Maxine’s Skinny Pills certainly contains all the right ingredients, some of them are slightly underdosed. For example, you ideally want acetyl l-carnitine to be dosed in the vicinity of 2000mg and cayenne extract at around 150mg. The trouble with pills and capsules though is that you have a limited amount of space to fit a range of ingredients. Used by itself, it may not offer the right amount of fat loss ingredients to make a massive difference, but may offer added benefit when used in conjunction with other fat loss support products such as Maxine’s Burn Protein. 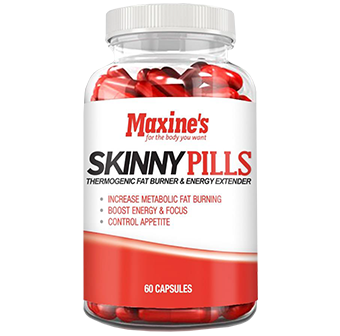 As the name suggests, Maxine’s Skinny Pills only come in capsule form, with each container providing 60 capsules for 60 servings. Maxine&rsquo;s Skinny Pills are a super convenient fat loss supplement that has included some of the best ingredients for weight loss around. Although it could be better dosed, it still offers a strong boost to general metabolism, thermogenesis, focus and energy levels. For best effects, it’s recommend to use the Skinny Pills with a good protein powder such as Maxine’s Burn Protein and a weight loss recovery product such as Maxine’s Recover. If you’re ready to get serious with fat loss, then Maxine’s Skinny Pills are right up your alley. 2. Mansour MS, Ni YM, Roberts AL, Kelleman M, Roychoudhury A, St-Onge MP. ‘Ginger consumption enhances the thermic effect of food and promotes feelings of satiety without affecting metabolic and hormonal parameters in overweight men: a pilot study.’ Metabolism. 2012 Oct;61(10):1347-52. 3. Whiting S, Derbyshire E, Tiwari BK. Capsaicinoids and capsinoids. A potential role for weight management? A systematic review of the evidence. Appetite. 2012 Oct;59(2):341-8.